If a strong visual strategy is key to your business, it’s likely that you’ve spent countless hours – or dollars – designing perfect image after perfect image. It’s no secret that creating high-quality content is time-consuming and costly, which means that the pressure is constantly on to maximize engagement, optimize distribution and deliver ROI with each image you share. And when it comes to social, timing is of the essence. In addition to finding the right image, you have to effectively caption, hashtag, and target to the proper audiences. 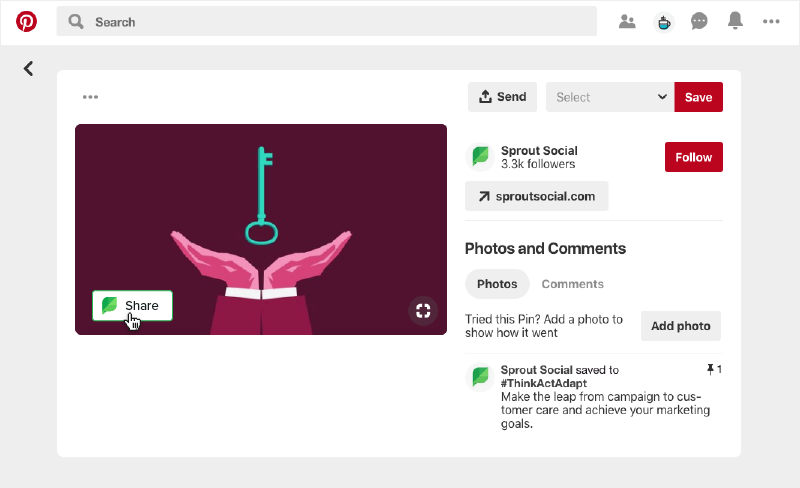 To save you some time when executing your visual strategy on Instagram and Pinterest, Sprout has invested in a variety of simple tools that will help you streamline content curation, increase reach on your posts – and most importantly, extend the life cycle of your posts. When it comes to text-based content like blogs, many social teams tap into third-party content to capture the full breadth of their digital strategy. Curating and highlighting content from other notable publications or blogs is a reliable way to promote your brand, form partnerships with similar brands and deepen community trust. Leveraging third-party content should also play a part in your visual strategy. That’s why we’ve made it really easy to curate and share third party content for Instagram and Pinterest in Sprout. 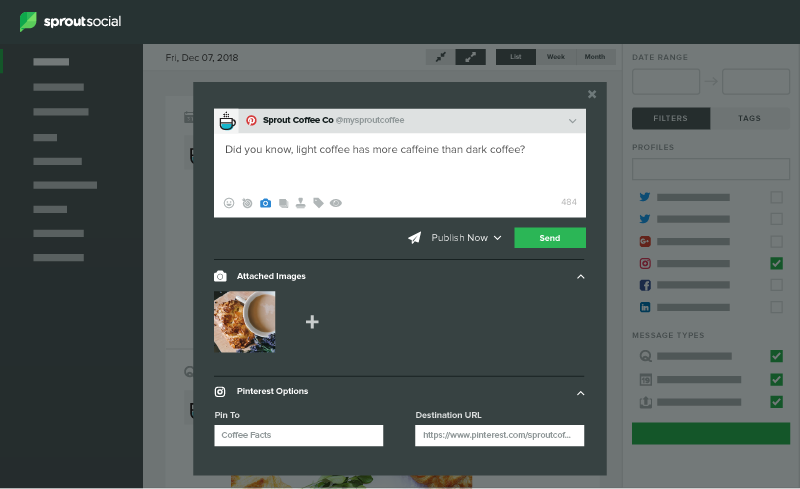 With a simple workflow using Sprout’s Browser extension, you can quickly save Pins on Pinterest for content curation and publishing. And when gathering new content to feature on your Instagram profile, you can also make use of the browser extension to regram posts and choose to either save, schedule, or queue your post. As a best practice, many brands add a long list of relevant hashtags to every Instagram post for more visibility, profile visits and audience growth. On Pinterest, the same practice also helps to surface more of your Pins in relevant searches and feeds when hashtags are included in the Pin description. When it comes to Instagram, some of the more sophisticated marketers have discovered that the best way to incorporate hashtags into posts is to add them as the first comment. By adding hashtags as a first comment instead of the caption, you avoid cluttering your message content and and keep your audience focused on your brand’s message. When planning your social strategy, every minute saved is an opportunity to engage with your community, discover new content or optimize future marketing efforts. 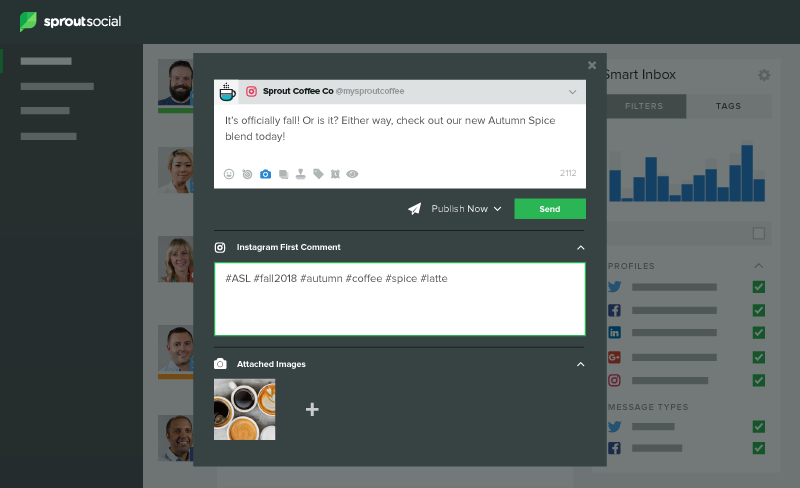 While crafting your Instagram content, save some time by planning or publishing the first comment for the additional hashtags directly in Sprout – without sacrificing a clean and polished caption. Cross-promotion is a key component of any digital strategy because it enables brands to maintain a following across multiple platforms and networks. Tapping into each network’s unique strengths increases engagement for social posts. While Instagram lends itself to immediate engagement, Pinterest builds engagement over time. By cross-posting published Instagram posts to Pinterest, you can surface your content across Pinterest’s discovery surfaces (homefeed, search and related Pins) over the coming weeks and months; fostering more engagement on your media and growing both your Pinterest and Instagram followers. When brands cross-promote, the content lifecycle extends beyond its publishing date; providing more opportunities for new audiences to view, engage or connect with your brand. 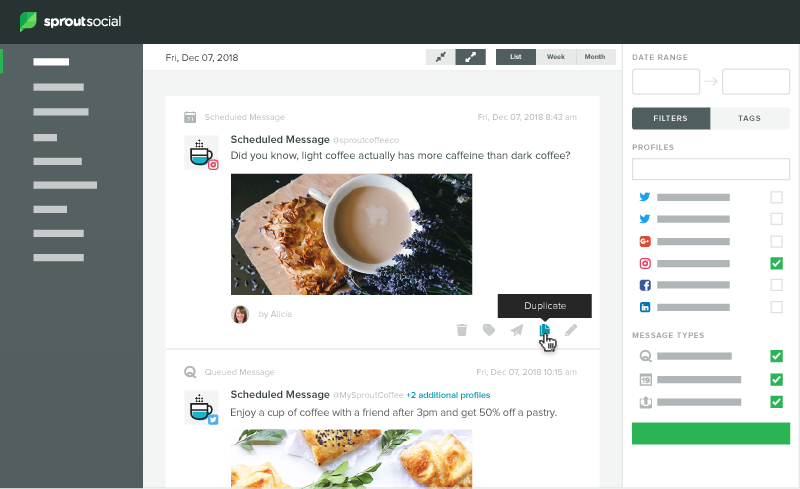 Luckily, you can easily implement this technique in Sprout and cross-post your Instagram content to Pinterest directly from the Publishing Calendar. Efficiently cross-promoting visual content on Pinterest to Instagram creates a positive snowball effect – driving better results on Instagram by tapping into the long-term nature of Pinterest content. If you have not yet done so, get started by claiming your brand’s account on Pinterest for improved content distribution and access to additional features or resources. There’s a ton that you can do to enhance your visual strategy – curating, commenting and cross-promoting are just a few tricks that will help to kick you into high gear. If you are looking to get started with a more advanced visual strategy and leverage the power of Pinterest, you can learn more about our Pinterest integration here. Amber Washington: Amber is a Product Marketing Specialist and Chicago transplant, originally from Jacksonville, Florida. In her free time, she's advocating for diversity in tech, trying new restaurants and planning her next adventure.